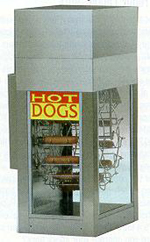 Juicy Hot dogs glisten as they rotate twice with each rotisserie revolution. You`ll never burn a dog. The Bun Warmer at top rests over a water pan that keeps buns warm and moist. This simple to use machine features tinted tempered glass panels, die-cast aluminum horn, cutting head and pusher, adjustable stainless steel cutting blades, Safety Re-set Button, Snow Cone Shaper, polycarbonate service door and a molded plastic drainage deck. -	Crushes small amounts or up to 500 lbs. of cube or chunk ice per hour. -	Safety re-set button to prevent accidental start-ups. -	Adjustable cutting blades from fine to coarse. This Table-Top Cotton Candy Machine will produce a few or up to 60 cones per hour. The unique heating element gets to flossing temperature in just seconds allowing for quick operation making it ideal for making only one cone at a time. The simple two-switch system allows for easy operation. This Professional Cotton Candy Machine comes complete with a stainless steel bowl and acrylic dome. Weighing just 21 pounds, it can easily be transported to and from any location. 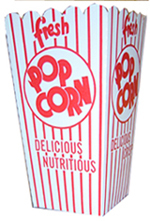 The word POPCORN animates, and the popcorn POPS. 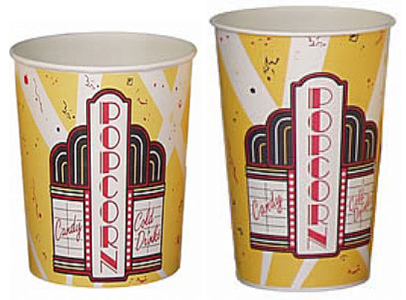 PROFESSIONAL, Heavy-Duty Cups Fabricated For Buttered Popcorn. 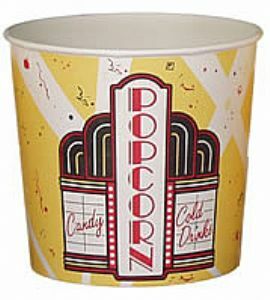 PROFESSIONAL, Heavy-Duty Tubs Fabricated For Buttered Popcorn. 6.5 H x 7 Diam. 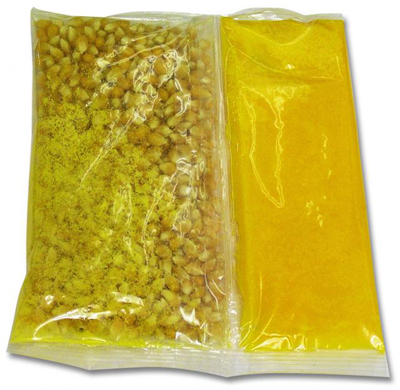 These Bags Are Specially Coated to Prevent Butter From Leaking Through. Their Flat Bottoms Allow Them to Stand Upright. 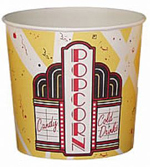 These Closed Top Boxes are great for when popcorn must be carried or transported. Available in THREE Convenient Sizes to fit your needs. 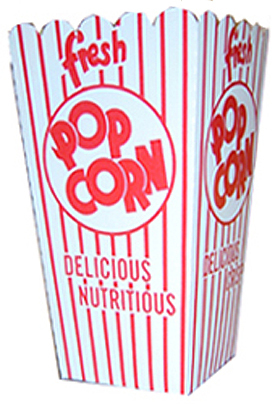 Serve Your Popcorn in These Attractive Paper Bags. Our Disposable Bags have a Colorful Theatrical Design and are Available in TWO popular Sizes. 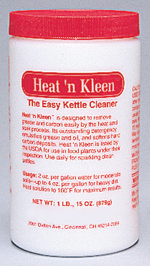 All Three Ingredients In Pre-Measured Bags With Exactly The Right Amount For your 4 Ounce, 6 Ounce, or 8 Ounce Kettle. Same Delicious Corn Used In most Theatres And Vendors Worldwide. PROFESSIONAL -- Inside The Kettle Cleaner. Safer Than Any Other - Non Toxic. Just Heat A Few Tablespoons with Water In Your Popper Kettle. 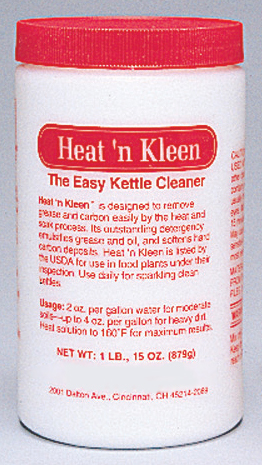 It Softens Carbon Build-Up In Minutes. 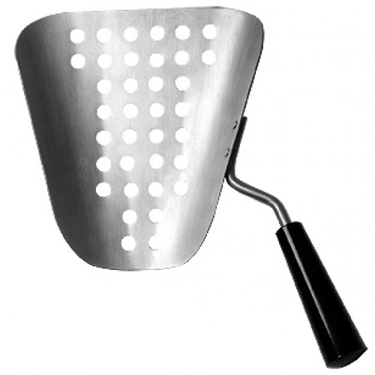 Our Perforated Aluminum Popcorn Scoop Allows Any Unpopped Kernels To Fall Through The Holes. Only Popped Corn Fills Your Box. PROFESSIONAL Heavy-Duty Adjustable Pump Dispenses Hot Delicious Butter (or substitute) Onto Your Popcorn. All Stainless Steel Construction With Lighted Sign. Snow Cone Syrups are available in one gallon containers. Our Six Ounce Snow Cone Cups are the ideal serving size for snow cones and are packaged in 200 per case. Our convenient Starter Kit has everything you will need to make 200 Cotton Candy Cones. The Kit includes Three Various Flavors of Sugar Floss (3.25# cartons) and 200 Paper Cotton Candy Cones. Our Specially Formulated Sugar Floss comes in a 3.25 lb. easy pour carton and is available in 4 popular flavors. Make your Flavor Choice below. Serve your guests their own concession trays full of yummy munchies and favorite beverage. Brightly designed with concession motif images....Fun..Food..Friends. Constructed of durable stock to hold up to small spills and condensation. 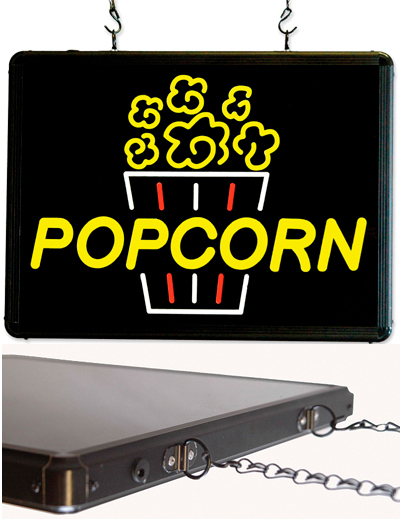 These fun trays help keep your theatre clean. 9 3/4 x 6 1/2 x 2. Our Professional Snow Cones Sign is Ultra-Bright. Extruded Aluminum Frame and LED Back Lighting. Two 3-ft hanger chains, and 12 volt converter included. This product usually ships within 2-3 business days! Our Professional Cotton Candy Sign is Ultra-Bright. 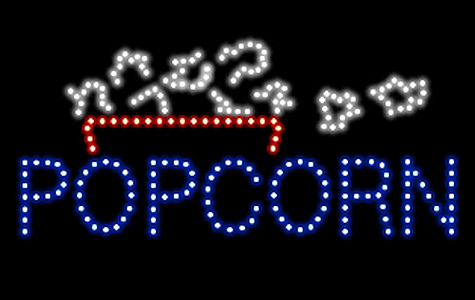 Our Professional Popcorn Sign is Ultra-Bright. 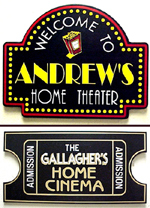 Simply Set This Sculptured Neon Sign On The Top of Your Popper or Any Other Location In Your Concession Area. Complete with a 12 volt adaptor and 6 foot cord that plugs into any standard 120 volt household outlet. The base has a convenient ON/OFF switch for ease of use. Welcome your guests to MY Home Theater. 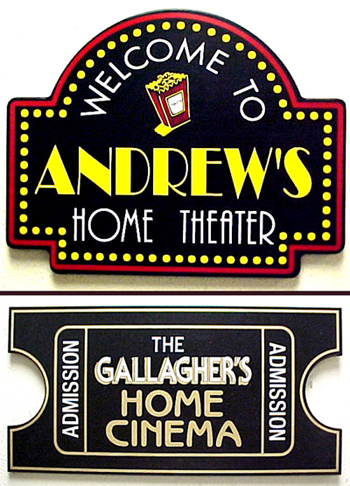 Customize these wooden signs with your name or the name of your theater. Keyhole slot on the back for easy wall hanging. Provide The Personalized Name below, with or without an Apostrophe S.
Ships within 5-8 business days. Our All Steel Laser Cut Theatrical Coffee Table Exemplifies Sturdy Construction with an Inset Tempered Glass Top. Matching our Theatrical End Table, Several Stage and Screen Iconic Designs are Cut into the Stunning Matte Black Metal Sofa Table. Our All Steel Laser Cut Theatrical End Table Exemplifies Sturdy Construction with an Inset Tempered Glass Top. Matching our Theatrical Coffee Table, Several Stage and Screen Iconic Designs are Cut into the Stunning Matte Black Metal End Table.